STRADANUS,J. - Christophorvs Colvmbvs Ligvr..
Christophorvs Colvmbvs Ligvr.. - STRADANUS,J. Size : 8.3 x 10.9 inches. / 21.0 x 27.7 cm. Description :A very good impression, printed with tone and displaying very good contrasts and clarity of details. From a series composed in 1592, to celebrate the centenary of the discovery of the New World by Columbus, and the following explorations by Vespucci and Magellan. The engraving is based on a drawing by Johannes Stradanus ( Jan van den Straet) and engraved by Adrian Collaert (Antwerp circa 1560 - 1612). 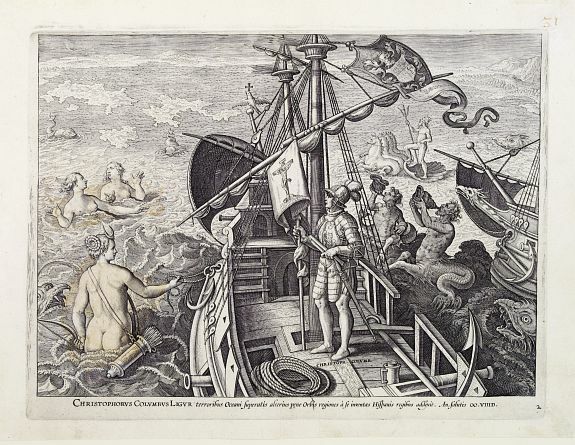 The print shows an allegory of Christopher Columbus (Cristobal Colon) 1451-1506. Born in Genoa, Italy. In Portugal, he became a master mariner and was determined to reach India by sailing west. After eight years of supplication, he received the backing of the Spanish monarchs FERDINAND V and ISABELLA I. On Oct. 12, 1492, his ships, the Nia, Pinta, and Santa Maria, reached Watling Island, in the Bahama group, later they touched CUBA and HISPANIOLA. He was made an admiral and governor general of all new lands. In 1493 he set sail with 17 ships, exploring PUERTO RICO and the Leeward Islands, and founding a colony in Hispaniola. In 1498 he explored VENEZUELA, realizing that he had found a continent. Because of disreputable conditions in Hispaniola, he was replaced as governor in 1500 and returned to Spain in chains. Condition : Paper slightly washed, still some remains of contemp. censorship staining over naked bodies visible. Generally in very good condition.